SUNY Oswego's production of "The Wizard of Oz" in late October in modernized Waterman Theatre will introduce area schoolchildren chosen in public auditions as munchkins. 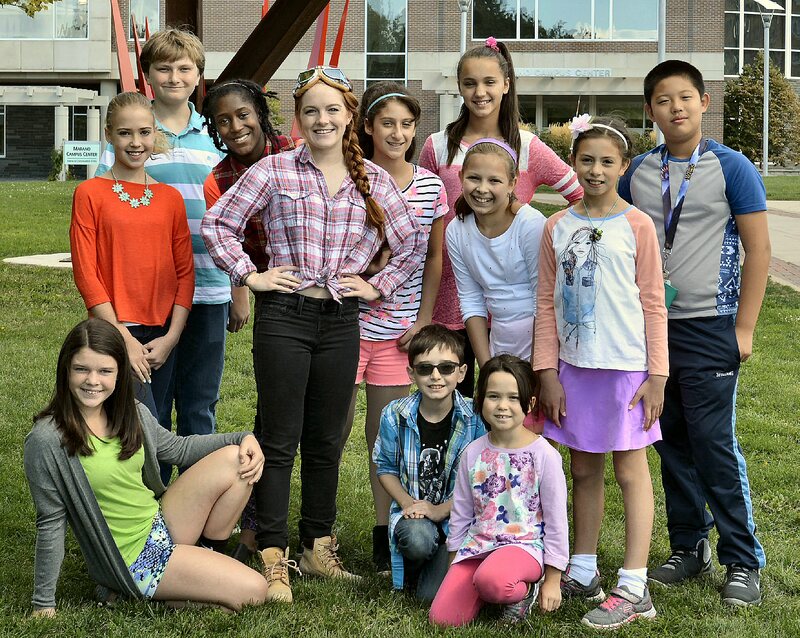 Joining Megan VanVorce (center, as Dorothy) are (from left in front) Azalia Avery, Ben Norton and Leah Norton, and (standing from left) Makayla Nadzadi, Griffin Marriner, Lyric Joseph, VanVorce, Meli Preston, Rimma Mankiewicz, Brooklyn Saternow, Liliana Springston and Xiaodao Lin. OSWEGO — To celebrate the grand reopening of renovated Tyler Hall and Waterman Theatre, the SUNY Oswego theater and music departments will stage a contemporary twist on the classic musical “The Wizard of Oz,” swapping out the yellow brick road for train tracks. SUNY Oswego’s production of “The Wizard of Oz” in late October in modernized Waterman Theatre will introduce area schoolchildren chosen in public auditions as munchkins. Joining Megan VanVorce (center, as Dorothy) are (from left in front) Azalia Avery, Ben Norton and Leah Norton, and (standing from left) Makayla Nadzadi, Griffin Marriner, Lyric Joseph, VanVorce, Meli Preston, Rimma Mankiewicz, Brooklyn Saternow, Liliana Springston and Xiaodao Lin. In the campus-community tradition that has marked Tyler Hall’s 48-year history, “The Wizard of Oz” will include area schoolchildren as munchkins as it previews at 7:30 p.m. Oct. 20, and runs at 7:30 p.m. Oct. 21, 27 and 28, with matinees at 3 p.m. on two Saturdays, Oct. 22 and 29. The Oct. 29 matinee is dedicated to homeless teenagers and will feature a talkback session after the performance. The concept for this production is inspired by the hobo lifestyle and the practice of train hopping, said director Jonel Langenfeld of SUNY Oswego’s theater faculty. She described the design theme as “hobo-chic” and “steampunk” with elements such as metal beams and special effects, including projections. L. Frank Baum’s beloved “The Wizard of Oz” remains very familiar, with the same characters and basic plot line; it is just set in a more “contemporary world,” Langenfeld said. Dances are set to each number, choreographed by SUNY Oswego alumnus Dexter Jones, class of 1986. The choreographer, actor and teacher commutes from New York City every weekend to work with the students. Her mother grew up during the Great Depression and told stories of hobos showing up at her house looking for food and shelter. Langenfeld’s adopted son lived as a train hopper for a time until he broke his pelvis after falling off a train. The director said she feels that most college students and many in the audience can relate to the theme: learning where one fits in life by “finding” oneself, made vivid through the train-hopping metaphor. “This is a very important show to me, because it really resonates around here,” Langenfeld said. Senior theater major Ayanna Stallings, the play’s assistant director, said the cast has really embraced the message Langenfeld is trying to project. Broadcasting and mass communication major Julia Tilley, dance captain and lead dancer, said she really relates to the message, especially as a college freshman. “I think anytime you’re in a new situation, or anytime you do anything different, it’s very difficult to figure out where you belong,” she said. Langenfeld made it a goal to get the Oswego community involved in this production. “With the reopening of Waterman Theatre, I really wanted the local community to feel like they belong,” said Langenfeld, who has participated in community theater ventures with H. Lee White Marine Museum, Fort Ontario and others. After holding open auditions this summer, she cast 10 local children ages 7 to 14 to play munchkins in the production. Makayla Nadzadi, an 11-year-old munchkin from Charles E. Riley Elementary School in Oswego, said she’s excited to work with SUNY Oswego students. SUNY Oswego students play the iconic main characters: Megan VanVorce (Dorothy), Anthony Sagrestano (Scarecrow), Seth Prevratil (Tin Man), Dwan Hameed (Cowardly Lion), Wyatt Gilbert (Wizard), Alesha Frasier (Auntie Em/Glinda) and Alex Matsu (Gulch/Wicked Witch). Tickets for “The Wizard of Oz” are $18 ($56 for a family four-pack; $7 for SUNY Oswego students with ID), available at all SUNY Oswego box offices, online at tickets.oswego.edu or by calling (315) 312-2141. All tickets to the Oct. 20 preview performance are $5. Parking is included in the price of a ticket, and is available in the employee lot in front of Culkin Hall and the employee and commuter lots behind Hart and Funnelle residence halls. Those attending needing assistance should contact the box office prior to the performance.